The main gate of Auschwitz I. The sign reads Arbeit Macht Frei, meaning Work will set you free. Famous photo of Hungarian Jewish children and an elderly woman on the way to the gas chambers of Auschwitz II (1944). Auschwitz (pronounced "OW-sh-vitz") was a group of concentration camps run by Nazi Germany during World War II. There were three large camps at Auschwitz, and 3 smaller ones (called subcamps). Auschwitz I was the main camp, which held prisoners from 1940-1945. Auschwitz II (Birkenau) was the largest extermination camp (death camp) run by Nazi Germany during The Holocaust. 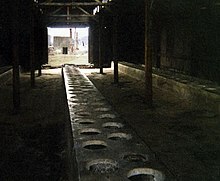 Auschwitz III (Monowitz) and the subcamps were forced labor camps where prisoners worked as slaves. The Auschwitz camps were in a town in Poland called Oświęcim. ("Auschwitz" is the German name for "Oświęcim.") In German, Auschwitz was called Konzentrationslager Auschwitz (KZ Auschwitz), which means "Auschwitz concentration camp." It was also called Vernichtungslager Auschwitz (VL Auschwitz), which means "Auschwitz extermination camp." The Schutzstaffel (SS), led by Heinrich Himmler, ran the death camps and concentration camps in Nazi Germany. No one knows exactly how many people were sent to Auschwitz, or how many died there. However, historians estimate that between 1940 and 1945, the Nazis sent at least 1.3 million people to Auschwitz. About 1.1 million of these people died or were killed at Auschwitz. In extermination camps, almost everyone was killed right after they got to the camps. The Nazis killed about 3.0-3.5 million people in these death camps. 90% of them were Jewish people. Every day, Nazi authorities brought many prisoners to Auschwitz on trains. The camp's SS doctors separated these prisoners into three groups. This was called "selection." Selection was how the SS decided which of Auschwitz's camps each prisoner would go to. Most prisoners sent to Auschwitz were selected for death. This means the SS decided they should be killed right away. Usually, the SS put all children, most women, all elderly people, people who looked sick, and people who looked like they could not work in this group. SS guards brought these people right to Auschwitz's gas chambers and killed them with poison gas. They used a form of hydrogen cyanide, a type of poison gas called a blood agent. They called this poison gas Zyklon B. Thus in an instant, our women, our parents, our children disappeared. We saw them for a short while as an obscure mass at the other end of the platform; then we saw nothing more. The SS selected some strong, healthy people to be slave workers. They worked at Auschwitz I; at an IG Farben factory at Auschwitz III; and at munitions factories in the sub-camps. Records say that between 1940 and 1945, about 405,000 people worked as slave laborers, and about 84% of them (340,000) died. Oskar Schindler, a German business owner, saved about 1,000 Jews from Poland. He sent them away to his factory, and these Jews lived. One of the camp's doctors, Joseph Mengele, was interested in twins and dwarves. The SS would send these people to the camp "hospital" so Mengele could do medical experiments on them. The SS chose some people to help guard the other prisoners. Often, they chose violent criminals for this job. They called these people "kapos." The SS also chose some people to work in and around the gas chambers and crematoria. They called these people Sonderkommando. Auschwitz I was the office for all of the camps in the Auschwitz complex. [W]e had to line up in five rows... [SS guard] Frizsch announced: "This is Auschwitz Concentration Camp... Any resistance or disobedience will be ruthlessly punished. Anyone disobeying superiors, or trying to escape, will be sentenced to death. Young and healthy people don't live longer than three months here. Priests one month, Jews two weeks. There is only one way out—through the crematorium chimneys." Next were 48 homosexual men from Germany. Then Jews arrived as prisoners. From 1940-1941, at any time, there were between 13,000 and 16,000 prisoners in Auschwitz I. By 1942, there were 20,000. Most of these prisoners were not Jewish, because most of the Jewish prisoners were sent to Auschwitz II. At Auschwitz, the prisoners had to put marks on their uniforms to show why they were sent to Auschwitz. For example, Jewish prisoners had to sew two yellow triangles onto their clothes, in the shape of a Star of David. Homosexual people had to sew a pink triangle onto their clothes. The SS also gave each prisoner a serial number and tattooed the number on the prisoners' bodies. The SS never called prisoners by their names, only by their numbers. The living conditions at Auschwitz I were very bad. Prisoners got very little food. There was no sanitation, which made it easy for diseases to spread. Many prisoners died from diseases, starvation, and freezing to death. On Sundays, the prisoners had to clean their barracks, and were allowed to shower. Standing cells: These were rooms that were 1.5 square metres. The SS would keep four people in one of these rooms. The rooms were so small that the prisoners would have to stand all night. Then they would have to work during the day. Starvation cells: The SS would lock prisoners into these rooms, and did not give them any water or food. They would leave the prisoners to die of dehydration or starvation. Suffocation cells: These were rooms with only one small window. The SS would lock many prisoners into these rooms. As the prisoners breathed in the oxygen in the room, there would be less and less oxygen left. Eventually, there would be so little oxygen left in the room that the prisoners would suffocate. Sometimes, the SS would tie a prisoner's hands behind his back and hang him by his wrists. This would break the person's shoulder joints. The SS would leave prisoners hanging like this for hours or days, sometimes until the prisoners died. The SS also hung some prisoners by the neck, so they would die a slow and painful death. The SS tried killing prisoners with Zyklon B for the first time at Auschwitz I, on 3rd September 1941. Today, the gas chamber still exists. It has been re-built, using its original parts. Now, it is a part of the museum at Auschwitz. On 26th March 1942, the SS sent the first women prisoners to Auschwitz. In 1943, Heinrich Himmler ordered the SS to create a brothel in Auschwitz. Non-Jewish women prisoners were forced to work in the brothel. Prisoners who were important to the Nazis, like kapos and chefs, were allowed to use the brothel as a reward. Heinrich Himmler also ordered homosexual prisoners to visit the brothel every week. He thought this would 'cure' them of being homosexual. Johanna Langefeld, Maria Mandel, and Elisabeth Volkenrath were in charge of the women prisoners at Auschwitz. Criminal Joseph Mengele did medical experiments on many prisoners, especially twins, dwarves, and people with physical disabilities. All of these experiments were very crude and painful. For example, Mengele castrated some prisoners without using any anesthetics. Many women and men died during these experiments. Mengele was also in charge of Auschwitz's camp "hospital." This was not like a regular hospital. Prisoners who were doctors, like Gisella Perl, worked there. They tried to help prisoners who were sick or hurt, but they had no medications or medical supplies, not even clean bandages or running water. If patients did not get better quickly, Mengele sent them to the gas chambers, or Nazi doctors killed them by injecting them with phenol. Auschwitz II was Auschwitz's death camp. It was also called Birkenau (pronounced "BEER-kin-now"), which means "the birch wood" (forest). Today, Birkenau is often just called "Auschwitz." The Nazis began building Auschwitz II in October 1941, because Auschwitz I was getting too crowded. By this time, Adolf Hitler had decided to kill all of the Jewish people. The Nazis called this plan the "Final Solution." Soon after it was built, Heinrich Himmler ordered Auschwitz II to be used as a killing center. Its goal would be to kill every prisoner that was sent there. Auschwitz II was the largest death camp run by Nazi Germany during The Holocaust. The SS killed more people at Auschwitz than in any of the other Nazi death camps. The SS built Auschwitz II's gas chambers so that 2,000 people could fit inside at once. This meant they were able to kill about 2,000 people every 30 minutes in the gas chambers. Managers at the IG Farben factory were always trying to make the prisoners work harder. Often they threatened prisoners by saying they would be sent to the gas chambers if they did not work harder.p. 56 Every month, 20% of the slave workers at the factory (one out of every five) died or were sent to the gas chambers. Until the summer of 1943, Rudolf Höss was the commander of Auschwitz.p. 193 After him, Arthur Liebehenschel and Richard Baer became commanders of the camp. After World War II, Höss wrote an autobiography. He gave many details about Auschwitz's camps. At the Nuremberg Trials, he received the death penalty. He was hanged in front of the crematorium at Auschwitz I. By 1943, many resistance groups had formed inside Auschwitz's camps. These were groups who tried to fight back against the Nazis, any way they could. Resistance groups helped some prisoners to escape from Auschwitz. These people brought information to the world about the killings happening at Auschwitz. However, if one prisoner escaped, the SS killed many other prisoners. Sometimes, they brought the escaped prisoners' family members to Auschwitz. The SS did these things so that other prisoners would not try to escape. Overall, about 700 prisoners tried to escape from Auschwitz's three different camps. Of these 700, about 300 were able to escape. Some of the Sonderkommando at Auschwitz fought back against the SS. For example, in 1944, some of the Sonderkommando at Auschwitz blew up one of the camp's crematoria. Also in 1944, members of the Sonderkommando secretly took pictures inside Auschwitz. These are the only pictures that show the mass murder that was happening at Auschwitz. Members of the Polish resistance helped sneak the photographs out of the camp. The Allies got some information about Auschwitz's camps between 1941 and 1944. However, they did not believe that so many people were being killed at Auschwitz. Then two people, Rudolf Vrba and Alfred Wetzler, escaped from Auschwitz. They wrote reports about what was happening at Auschwitz. From these reports, Allied leaders learned the truth about Auschwitz in the middle of 1944. During 1944, Allied airplanes had taken some photographs of the area, including Auschwitz. However, no one studied these photographs. The first time anyone looked at these photos carefully was in the 1970s. At one time, the Allies had planned to bomb the camps. However, they decided not to, because they did not want to kill any prisoners. In fact, some planes dropped bombs at nearby military targets. One bomb fell on the camp. It killed 315 prisoners and hurt 1425 more. People still argue about what the Allies could have done to save more of the prisoners at Auschwitz. Nobody knows exactly how many people died at Auschwitz, or other Nazi camps. The SS kept records, but they destroyed most of them. Historians have used many different ways of estimating how many people died at Auschwitz. For example, they have studied what witnesses at the Nuremberg Trials said. Some people who survived Auschwitz also helped to estimate how many people died there. Rudolf Höss said that 2.5 million to 3 million people died there Later he wrote that he made a mistake, saying "the figure of two and a half million [is] far too high." In 1983, French scholar George Wellers was one of the first people to use the Nazis' records about deportations to estimate the number killed at Auschwitz. He calculated that 1.613 million died, including 1.42 million Jews and 146,000 Poles. Around the same time, Franciszek Piper used records of train arrivals and deportations to calculate 1.1 million Jewish deaths; 140,000-150,000 Polish deaths; and 23,000 Roma deaths. A few years after World War II ended, the government of Poland decided to rebuild Auschwitz and put a museum there. They repaired some of the camps. Sometimes they made very small changes from the original setup. Auschwitz II and the remains of the gas chambers. About 110,000 men's, women's, and children's shoes. The shoes belonged to people who were killed at Auschwitz. About 3,800 suitcases, which people sent to Auschwitz brought with them. When people were sent to Auschwitz, the Nazis told them they were just going to another place to live. So people brought suitcases with many things they thought they would need. Other things that people sent to Auschwitz brought with them. These include over 12,000 kitchen utensils; eyeglasses; clothing; and many other things. Things the SS used to kill prisoners. These include fake shower heads for the gas chambers; cans of Zyklon B; the door of one of the gas chambers; and a crematorium. In 1947, the museum was opened for the public. Later, people scattered the ashes of Auschwitz's victims between the huts where the prisoners lived. They see the entire area as a gravesite. In 1979, the United Nations Educational, Scientific, and Cultural Association (UNESCO) made Auschwitz a World Heritage Site. Also in 1979, Polish Pope John Paul II celebrated Mass at Auschwitz II. Maximilian Kolbe, a Polish priest. The Nazis sent him to Auschwitz because he helped Jewish refugees. When three men escaped from Auschwitz, the SS chose ten other prisoners to be starved to death as revenge. When one of those prisoners started to cry about his family, Kolbe volunteered to be killed in his place. Edith Stein, a Jewish woman who converted to Catholicism and became a Carmelite nun. The SS killed her in the gas chambers at Auschwitz. In 2005, the United Nations made 27 January the International Holocaust Remembrance Day. They chose 27 January because it is the day that the Red Army freed Auschwitz. On 27 January 2005, the European Parliament marked the anniversary of Auschwitz's liberation with a minute of silence. The European Parliament also passed a resolution saying that the murder of about 1.5 million people at Auschwitz's camps was terrible. The Parliament said they passed the resolution partly because of “the disturbing rise in antisemitism, and especially antisemitic incidents, in Europe, and for learning anew the wider lessons about the dangers of victimizing people on the basis of race, ethnic origin, religion, social classification, politics or sexual orientation." After World War II, the communist governments of the Soviet Union and Poland put up a memorial sign at Auschwitz. The sign said 4 million people died at Auschwitz. After the fall of the communist government in Poland in 1989, the sign was changed to say that 1.1 million people died there. People who try to deny the Holocaust use this difference to claim that the Holocaust was propaganda. However, the Holocaust is a fact of history, and the SS killed at least 1.1 million people at Auschwitz. 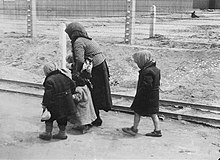 Starting in 1989, the Polish government and media argued that it was not fair to use the name "Polish death camps" to describe the Auschwitz camps. They said this name made it seem like Poland ran the death camps. In fact, Nazi Germany had taken over Poland, and the Nazis ran the death camps.p. 73 In 2006, the Polish government asked UNESCO to change the name of the World Heritage Site at Auschwitz. They wanted UNESCO to change the name from "Auschwitz Concentration Camp" to "Former Nazi German Concentration Camp Auschwitz-Birkenau". The Polish government thought this would avoid misleading the public and would show that Nazi Germany ran the camp, not Poland. In 2007, UNESCO agreed, and changed the site's name to "Auschwitz Birkenau: German Nazi Concentration and Extermination Camp (1940-1945)." The Polish government had allowed filming at the sites for two movies, and a TV series. However, in some cases, they did not allow filming inside the camps. In February 2006, Poland refused visas to some researchers from Iran who wanted to visit Auschwitz. They did this because the President of Iran, Mahmoud Ahmadinejad, has denied the Holocaust, and even said that it is "a myth." In 1984, the Carmelites opened a convent near Auschwitz I. Jewish groups protested, and the Carmelites removed the convent in 1993. In 1987, after Pope John Paul II beatified Edith Stein, Catholic people put up a cross near the gas chamber. After some time, a Star of David appeared at the site. Many religious symbols appeared. Finally, people removed all of them. In 1988, the Carmelites put up an 8-metre (26-foot) tall cross outside block 11 at Auschwitz. Jewish groups protested, saying that most of the people killed at Auschwitz were Jewish. By 1998, 300 smaller crosses had appeared. Finally, people removed the smaller crosses. However, the larger cross is still there. ↑ Shuter, Jane (1999). Auschwitz (Visiting the Past). Heinemann. p. 4. ISBN 0431027811. ↑ 2.0 2.1 2.2 "Glossary". A Teacher’s Guide to the Holocaust. College of Education, University of South Florida. Retrieved February 17, 2016. ↑ McNab, Chris (2009). The SS: 1923–1945. London: Amber Books. p. 18. ISBN 978-1-906626-49-5. ↑ 4.0 4.1 4.2 4.3 4.4 "Auschwitz". Holocaust Encyclopedia. United States Holocaust Memorial Museum. January 29, 2016. Retrieved February 17, 2016. ↑ 5.0 5.1 5.2 5.3 ""Final Solution": Overview". Holocaust Encyclopedia. United States Memorial Holocaust Museum. January 29, 2016. Retrieved February 17, 2016. ↑ Piper, Franciszek; review of Meyer, Fritjof. "Die Zahl der Opfer von Auschwitz. Neue Erkentnisse durch neue Archivfunde", Osteuropa, 52, Jg., 5/2002, pp. 631-641. ↑ 8.0 8.1 8.2 Piper, Franciszek (1994b). "The Number of Victims". In Gutman, Yisrael; Berenbaum, Michael. Anatomy of the Auschwitz Death Camp. Bloomington, Indiana: Indiana University Press. pp. 61–76. ISBN 0-253-32684-2. ↑ 9.0 9.1 9.2 9.3 9.4 9.5 "The Implementation of the Final Solution: Auschwitz-Birkenau Extermination Camp". Yad Vashem. Yad Vashem: The Holocaust Martyrs’ and Heroes’ Remembrance Authority. Retrieved February 19, 2016. ↑ 10.0 10.1 10.2 Levi, Primo (1995). Survival in Auschwitz. Touchstone. ISBN 978-0684826806. ↑ Nelson, David L.; Cox, Michael M. (2000). Lehninger Principles of Biochemistry. New York: Worth Publishers. pp. 668, 670–671, 676. ISBN 1-57259-153-6. ↑ Longerich, Peter (2010). Holocaust: The Nazi Persecution and Murder of the Jews. Oxford; New York: Oxford University Press. p. 281. ISBN 978-0-19-280436-5. ↑ Cymet, David (2012). History vs. Apologetics: The Holocaust, the Third Reich, and the Catholic Church. Lexington Books. p. 272. ISBN 978-0739132951. ↑ "Oskar and Emilie Schindler: Germany". Righteous Among the Nations. Yad Vashem: The Holocaust Martyrs’ and Heroes’ Remembrance Authority. Retrieved February 19, 2016. ↑ 15.0 15.1 15.2 15.3 15.4 Kubica, Helena (1998) . "The Crimes of Josef Mengele". In Gutman, Yisrael; Berenbaum, Michael. Anatomy of the Auschwitz Death Camp. Bloomington, Indiana: Indiana University Press. pp. 317–337. ISBN 978-0-253-20884-2. ↑ Greif, Gideon. "We Wept Without Tears": Interviews with Jewish Survivors of the Auschwitz Sonderkommando. pp. 101–102. ISBN 978-0300211979. ↑ 18.00 18.01 18.02 18.03 18.04 18.05 18.06 18.07 18.08 18.09 18.10 18.11 18.12 18.13 18.14 Steinbacher, Sybille (2005) . Auschwitz: A History. Munich: Verlag C. H. Beck. ISBN 0-06-082581-2. ↑ 19.0 19.1 Langbein, Hermann (2004). People in Auschwitz. University of North Carolina Press. p. IX. ISBN 978-0807828168. ↑ "General Meeting of the International Auschwitz Committee and a Special "Meeting of the Generations" in Oswiecim". International Auschwitz Committee. Internationales Auschwitz Komitee. Retrieved February 17, 2016. ↑ "Marking of Jewish Prisoners". Auschwitz-Birkenau Memorial and Museum. Państwowe Muzeum Auschwitz-Birkenau. Retrieved February 20, 2016. ↑ Plant, Richard (1988). The Pink Triangle: The Nazi War Against Homosexuals. Owl Books. ISBN 0-8050-0600-1. ↑ "Tattoos and Numbers: The System of Identifying Prisoners at Auschwitz". Holocaust Encyclopedia. United States Holocaust Memorial Museum. January 26, 2016. Retrieved February 20, 2016. ↑ "Life in the Camp: Living Conditions". Auschwitz-Birkenau Memorial and Museum. Państwowe Muzeum Auschwitz-Birkenau. Retrieved February 20, 2016. ↑ 25.0 25.1 Gutman, Yisrael (1994). "Auschwitz—An Overview". In Gutman, Yisrael; Berenbaum, Michael. Anatomy of the Auschwitz Death Camp. Bloomington, Indiana: Indiana University Press. pp. 5–33. ISBN 0-253-32684-2. ↑ 26.0 26.1 26.2 Strzelecka, Irena (2010). Voices of Memory 4: Punishment in Auschwitz. Publication Department, Państwowe Muzeum Auschwitz-Birkenau. ISBN 978-83-60210-94-9. ↑ 27.0 27.1 27.2 Browning, Christopher R. (2004). The Origins of the Final Solution : The Evolution of Nazi Jewish Policy, September 1939 – March 1942. Comprehensive History of the Holocaust. Lincoln, Nebraska: University of Nebraska Press. p. 526. ISBN 0-8032-1327-1. ↑ 28.0 28.1 28.2 28.3 Piper, Franciszek (1994). "Gas Chambers and Crematoria". In Gutman, Yisrael; Berenbaum, Michael. Anatomy of the Auschwitz Death Camp. Bloomington, Indiana: Indiana University Press. pp. 157–182. ISBN 0-253-32684-2. ↑ Dwork, Debórah; van Pelt, Robert Jan (1997) . Auschwitz: 1270 to the Present. New York: Norton. p. 364. ISBN 0-393-31684-X. ↑ Young, Katie (2009). "Auschwitz-Birkenau". In Logan, William; Reeves, Keir. Places of Pain and Shame: Dealing with 'Difficult Heritage'. New York: Taylor & Francis. ISBN 978-0-415-45449-0. ↑ 31.0 31.1 "History of the Memorial". Auschwitz-Birkenau Memorial and Museum. Państwowe Muzeum Auschwitz-Birkenau. 2015. Retrieved February 18, 2016. ↑ "Women During the Holocaust". Holocaust Encyclopedia. United States Memorial Holocaust Museum. January 29, 2016. Retrieved February 20, 2016. ↑ "Introduction to NMT Case 1: U.S.A. v. Karl Brandt et al". Harvard Law Library, Nuremberg Trials Project: A Digital Document Collection. Retrieved February 20, 2016. ↑ Brown, D.P. (2002). The Camp Women: The Female Auxiliaries who Assisted the SS in Running the Nazi Concentration Camp System. Schiffer Publishing. ISBN 0-7643-1444-0. ↑ 38.0 38.1 38.2 Brugioni, Dino A.; Poirier, Robert G. (1979). The Holocaust Revisited: A Retrospective Analysis of the Auschwitz-Birkenau Extermination Complex (PDF) (Report). pp. 87–105. Retrieved February 20, 2016. ↑ 39.0 39.1 39.2 39.3 "Rudolf Hoess, Commandant of Auschwitz: Testimony at Nuremburg, 1946". Modern History Sourcebook. Fordham University. 1946. Retrieved February 20, 2016. I commanded Auschwitz until 1 December, 1943, and estimate that at least 2,500,000 victims were executed and exterminated there by gassing and burning, and at least another half million succumbed to starvation and disease, making a total dead of about 3,000,000. ↑ Krakowski, Shmuel (1994). "The Satellite Camps". In Gutman, Yisrael; Berenbaum, Michael. Anatomy of the Auschwitz Death Camp. Bloomington, Indiana: Indiana University Press. pp. 50–60. ISBN 0-253-32684-2. ↑ 42.0 42.1 42.2 42.3 Hoess, Rudolf (1959). Commandant of Auschwitz: The Autobiography of Rudolf Hoess. Weidenfeld & Nicholson. ISBN 978-1842120248. ↑ Bankier, David; Mikhman, Dan (2008). Holocaust Historiography in Context: Emergence, Challenges, Polemics and Achievements. Berghahn Books. p. 560. ISBN 978-965-308-326-4. ↑ 44.0 44.1 44.2 44.3 "Online Lessons: The Resistance Movement in Auschwitz". auschwitz.org. Państwowe Muzeum Auschwitz-Birkenau (Auschwitz-Birkenau Memorial Museum). Retrieved February 18, 2016. ↑ 45.0 45.1 Didi-Huberman, Georges (October 15, 2008). Images in Spite of All: Four Photographs from Auschwitz. University of Chicago Press. ISBN 9780226148168. ↑ Reiniger, Franziska. "Inside the Epicenter of the Horror – Photographs of the Sonderkommando". The International School for Holocaust Studies. Yad Vashem: The Holocaust Martyrs' and Heroes' Remembrance Authority. Retrieved February 18, 2016. 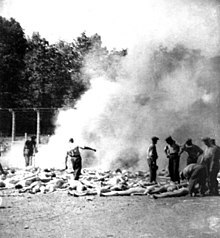 Among the millions of photographs that are related to Nazi death camps, only four depict the actual process of mass killing perpetrated at the gas chambers in Auschwitz-Birkenau. ↑ Vrba, Rudolf; Bestic, Alan (1986). Escape from Auschwitz: I Cannot Forgive. Grove Press. ISBN 978-0394621333. ↑ Wyman, David S. (1998). "Why Auschwitz Wasn't Bombed." In Yisrael Gutman & Michael Berenbaum (eds.). Anatomy of the Auschwitz Death Camp. Indiana University Press. p. 583. ISBN 0-253-32684-2. ↑ Kitchens III JH 1994. "The Bombing of Auschwitz Re-Examined". The Journal of Military History (Society for Military History) 58 (2). ↑ "Auschwitz". www.ushmm.org. Retrieved 2018-03-13. ↑ "Historical Collection". Auschwitz-Birkenau Memorial and Museum. Państwowe Muzeum Auschwitz-Birkenau. 2015. Retrieved February 18, 2016. ↑ 52.0 52.1 52.2 "World Heritage Committee Approves Auschwitz Name Change". United Nations Educational, Scientific and Cultural Organization – World Heritage Convention. UNESCO World Heritage Centre. June 28, 2007. Retrieved February 17, 2016. ↑ 53.0 53.1 53.2 53.3 53.4 Carroll, James (2002). Constantine's Sword: The Church and the Jews – A History. Houghton Mifflin Harcourt. ISBN 978-0-547-34888-9. ↑ "Saint Maksymilian Maria Kolbe: Polish Martyr". Encyclopaedia Britannica Online. Encyclopaedia Britannica, Inc. Retrieved February 20, 2016. ↑ "Teresa Benedict of the Cross Edith Stein (1891-1942): Nun, Discalced Carmelite, Martyr". Vatican News Service. The Vatican. October 11, 1998. Retrieved February 17, 2016. ↑ "Resolution Adopted by the General Assembly on the Holocaust Remembrance (A/RES/60/7, 1 November 2005)". The Holocaust and the United Nations Outreach Programme. United Nations. November 1, 2005. Retrieved February 20, 2016. ↑ "European Parliament Resolution on Remembrance of the Holocaust, Anti-Semitism and Racism". Texts Adopted by the European Parliament. European Parliament. January 27, 2005. Retrieved February 20, 2016. ↑ Andrew Breitbart. "Responses to Revisionist Arguments". motlc.wiesenthal.com. Los Angeles: Simon Wiesenthal Center. Archived from the original on 5 March 2005. Retrieved February 19, 2016. ↑ "Interview with the Minister of Foreign Affairs of the Republic of Poland, Prof. Adam Daniel Rotfeld: "We shall not let our country be libeled"". msz.gov.pl. Ministry of Foreign Affairs of the Republic of Poland. January 25, 2005. Retrieved February 19, 2016. 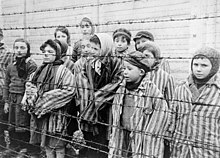 ↑ "Poland to Bar Iranian Team from Auschwitz". Payvand Iran News. Iran. February 18, 2006. Retrieved February 20, 2016. "Holocaust comments spark outrage". December 14, 2005. BBC News. Accessed February 18, 2016. Esfandiari, Golnaz. "Iran: President's Latest Comments About Israel Spark Further Condemnation". December 9, 2005. Radio Free Europe. Accessed February 18, 2016. "NCC Condemns Ahmadinejad's Holocaust Statement". December 16, 2005. National Council of Churches. Accessed February 18, 2016. ↑ "Spiegel Interview with Iran's President Ahmadinejad: "We Are Determined". Spiegel Online International. Spiegel Online. May 30, 2006. Retrieved February 18, 2016. ↑ "Rabbi unhappy at Auschwitz cross decision". BBC News. August 27, 1998. Retrieved February 20, 2016. Wikimedia Commons has media related to Auschwitz-Birkenau. This page was last changed on 4 April 2019, at 19:20.